THEN WE MIGHT HAVE EXACTLY WHAT YOU NEED FOR YOU TO HAVE A GREAT START! There are a lot of trainings, books, events and mentors that can help you with the knowledge and the skills of your team. But you know what the catch is? It is easy to develop knowledge if you have the skills and attitude. It is easy to develop skills if you have knowledge and attitude. You can develop even both if you have the right attitude! But without attitude you can develop none. So your main concern should be on how to bring the right attitude amongst your team, to nurture it and to make them work well together right from the start - achieve that and no goal will be too big because they will be able to gain the knowledge and the skills required to go to the top! HOW, you want to know! All that while having fun and developing great memories in the process! 10 hours of improvisation workshops, spread throughout 5 sessions. Your place or our place! For a group of 6 to 16 participants. Special price, for startups, starting from 299 euros. The workshops can be held both in English or Romanian. 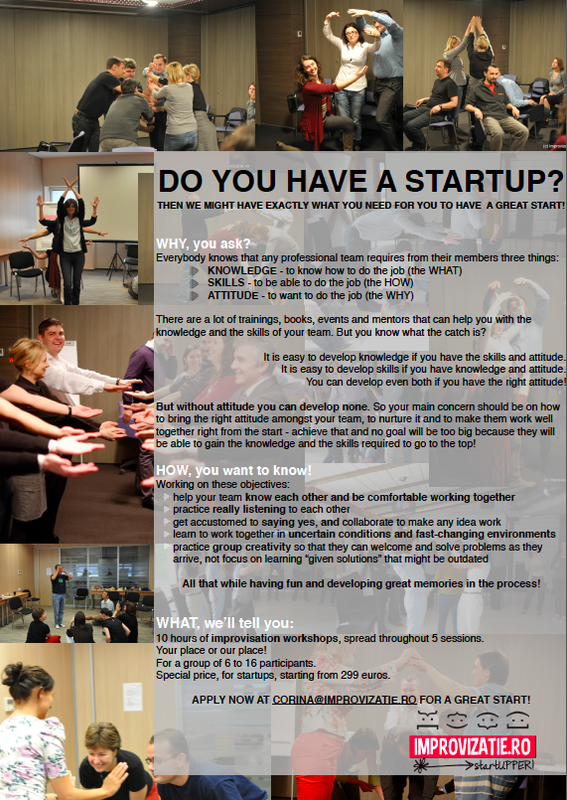 APPLY NOW AT CORINA@IMPROVIZATIE.RO FOR A GREAT START!